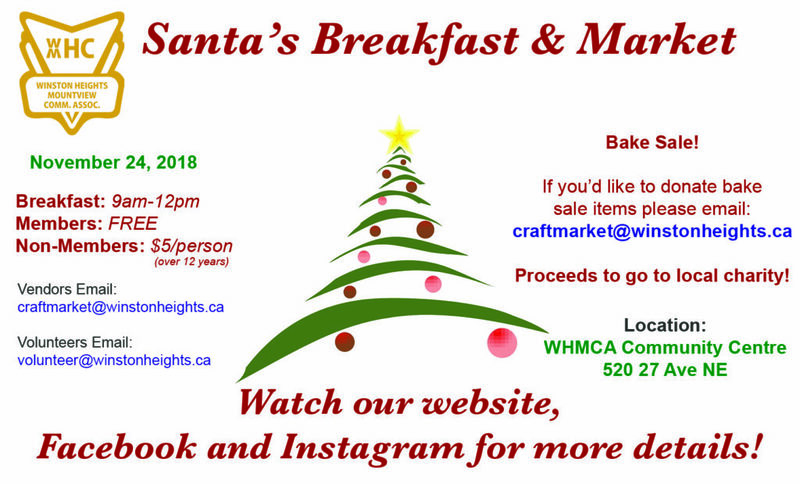 Please join us at the Winston Heights Community Centre for the Santa’s Breakfast and Craft Market on Saturday, November 24th. Breakfast will be served from 9:00 am to 11:00 am with Santa arriving by horse and wagon at 10:00 am. Market Tables will be open from 9:00 am to 12:00 pm with a wide variety of vendors. Get your Christmas shopping done early, and avoid the malls!! The breakfast is free to all Winston Heights-Mountview Community Association Members, and at a cost of $5 for non-members. Memberships will be available at the door, free for community residents and $10 for non-residents and businesses. A bake sale table will be set up and raising funds for our new rink boards. If you are interested in donating baking, please drop it off to the hall between 12pm – 8pm on Friday, November 23 or between 8am – 10am or on Saturday, November 24th. There will also be a box set up in the hall to collect food donations for The Mayor’s Food Drive. This is a great cause and a great way to share with those in need. If you have any questions please call the Community Centre at 403-276-5474 or by email craftmarket@winstonheights.ca. To volunteer email: volunteer@winstonheights.ca If you would like to be a vendor, please visit us here for details.